Material: Luminaire housing and connection to pole/arm in press-cast aluminium. Aluzink-treated stainless steel screws. Plane hardened protective glass with screenprint. Installation: On lamp post arm dia. 48 mm or dia. 60 mm or directly on a straight pole dia. 60 mm or dia. 76 mm. Connection: Luminaire is supplied with halogen-free connection cable FQQ. 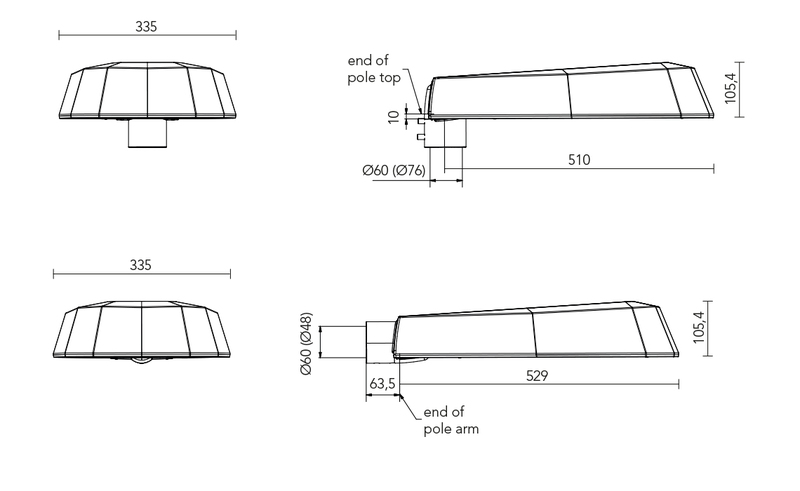 Cable length depending on the chosen luminaire flux. 6.5 m cable (2200 lm-6000 lm) or 10.5 m cable (8000 lm-10000 lm). Diffuser: Supplied with toughened glass. Pepper with 2200 lm, Batwing, comes with tempered glass and a frosted film for optimized glare shield. Light scattering: Available with two different light modules. Light module LM2: Lens configuration adapted for streets and footpaths. Light module LM3: Lens configuration adapted for broader streets and car parks. Batwing provides a well-dimmed asymmetric light pattern. Light source: LED module equipped with Cree XPG2. Colour temperature: 3000K or 4000K. Fitted with LEDiL lenses for street lighting. Luminaire flux and colour rendering: 2200, 2700, 4300, 6000, 8000 lm - CRI min. 80, 10000 lm - CRI min 70. Chromaticity tolerance: max 5 SDCM. Driver & light regulation: The luminaire is equipped with Xitanium FULL Programmable Outdoor LED driver from Philips. Lifespan: 100 000h (max 10% bortfall). Other: Pole and optional postarm are ordered separately. Projected wind area from below = 0,148 m². Projected wind area from the side = 0,053 m².